NIC 1 was born in the South Bronx. As a kid growing up there he would become fixated on the New York City Subway movement. Through the many colorful influences that he pick up living close to the subway train lines NIC 1 would become what he came to admire the most a subway artist. Being an active subway writer and loving the artwork that he would often see on the side of the subway trains he would grow to eventually photograph the subway movement. NIC 1 would become known as both an Aerosol artist and a Hip Hop Photographer. He has done many art shows and Gallery and Museum events from New York to LA and Paris, as well as Television and Movie background artwork. His artwork can be seen in various Graffiti books as well as his Graffiti Photography. 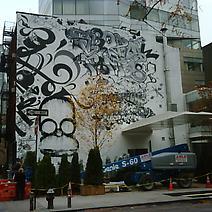 He’s had some of his artwork appeared in Glamour fashion magazine and a Calvin Klein advertisement featured in the New York Times Home Style section, as well as appearing in graffiti news articles in the New York Times.